Enter your email here to receive updates with the latest discounts on cards for popular stores. Collection of PII. When registering on or otherwise interacting with the Site, including submission of forms or applications, you may voluntarily provide PII. In addition, we use third-party advertising companies to serve ads and collect information other than PII when you visit the Site. Use of PII. We may use PII to personalize your Site experience, serve you, deliver Content, information and offers that may be of interest to you, respond to your questions and requests, and administer a promotion, survey or other Site feature. Third-party advertising companies may use information other than PII to provide advertisements on the Site, other sites and other forms of media. If you would like more information about this practice and to know your choices about not having this information used by these companies, click here: http://networkadvertising.org/consumer/opt_out.asp. Disclosure of PII. We will not provide PII to third-party advertising companies that serve ads. We generally do not sell or transfer PII to outside parties, except as described herein. The term “outside parties” does not include website hosting partners and other parties who assist us in operating the Site or conducting our business, provided that such parties agree to keep PII confidential. We share PII with relevant Partners, who may use the information in connection with your request or expression of interest. In the event that we sell or transfer assets of our company, we may provide PII to the purchaser. We may also release PII when we believe release is appropriate to comply with law, enforce these Terms or protect our or others’ rights, property or safety. Protection of PII. We will use reasonable security safeguards to protect PII against unauthorized access, disclosure, copying, use, theft and loss. Non-US Residents. The Site is operated in the United States (US). If you are located outside of the US, any information you provide us will be transferred to the US. By using the Site and/or providing information to us, you consent to this transfer. Children’s Privacy. We do not knowingly intend to collect PII from children under 13 years of age. If a child has provided us with PII, a parent or guardian of that child may contact us. After confirmation, we will make reasonable efforts to delete the child’s PII from the database that stores information for the Site. 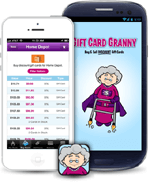 Gift Card Granny uses third-party advertising companies to serve our ads and collect information when users visit the Site. These third-party advertising companies employ cookie and 1x1 pixel .gifs or web beacons to measure and improve the effectiveness of ads for their clients. These companies may use information (not including your name, address, email address or telephone number) about your visits to our website and other websites in order to provide advertisements on our site, other websites and other forms of media about goods and services of interest to you. If you would like more information about this practice or to Out-Out of Internet-Based Advertising, and to know your choices about not having this information used by these companies, check out http://www.networkadvertising.org/managing/opt_out.asp.